Mr. Udemezue may I invite you to ikorodu branch to get the pulse of our members over this matter. I may not be in a position to speak or review NEC actions in this matter but the NEC has forced an undesirable leadership on the branch. The branch has been further plunged into more problems. NEC has simply forced a willing husband on and unwilling wife. Ogbaide’s petition is yet to be considered by national body before the GS letter halting the election came. What has become of the NEC resolution of 2018 wherein an election between ogbaide and Gloria was ordered and the National did nothing to it until the branch took steps to conduct the election. The petitioner in this case was given the reign of power over the branch in a branch where ogbaide can not win any election even if repeated over 20times. NEC ought to have sought for the greatest happiness of the greatest number of the members of the branch rather than the other way round. NEC has by its action foreclosed the right and claims of Gloria Cassius. Ikorodu branch was doing so well under the able leadership of the current exco until this setback. 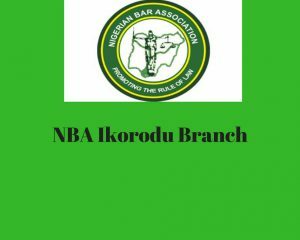 We strongly hope and believe in the leadership of Mr. President to help in any way possible to do justice in ikorodu branch issue. Mr. Udemezue I know you do a lot of research, please extend your research work to ikorodu and then come to a practical conclusion rather than your theoretical response.